Despite the rainy weather on Saturday 28 June, more than 30 LSBU students, staff and their friends proudly moved off with the parade from Baker Street on a two-mile route through the heart of the West End: Oxford Street, Regent Street, Piccadilly Circus, Pall Mall, Trafalgar Square and finally finishing in Whitehall. "LSBU took part in this event not only because it is exciting but also to show the university's respect and support for equality of all people, regardless of their sexual orientation or gender identity," says Terry Eastham, deputy assistant registrar at LSBU and a member of its LGBT+ staff network SONET. "The atmosphere on the parade was absolutely amazing and fortunately we were lucky enough to be at the front of the crowd with the VIPs—which allowed us to see a wonderful performance of Conchita Wurst and other great artists in Trafalgar Square while the rest of parade was still following up behind," says Terry. This year the parade was officially the largest London Pride in the history of the event. In fact, it was so big that when the front of the parade reached a final point, the back still hadn't left Baker Street. 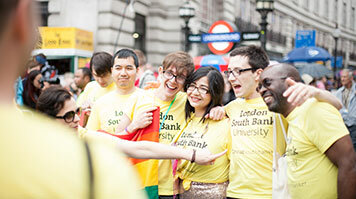 The sexual orientation and gender identity staff network SONET is part of LSBU's equality and diversity strategy, ensuring that the contribution of each member of staff and student is valued equally. LSBU staff have an important role in ensuring colleagues and students feel welcome, valued and have a good experience as part of our friendly community. In addition to LSBU there were more than 200 other organisations, community groups, companies and charities taking part in the parade. Talented photographer Bogdan Stăiculescu, a final-year BA Digital Photography student at LSBU, has taken a lot of great pictures which you can see on the LSBU Facebook page.